Wondering how to begin my stint as a newbie on the "Birding is Fun!" site, I thought long and hard about how best to get at it. Perhaps I might drop a sampling of verse that would give the readers my feathered flavor. I am a wanna-be poet and write quite a bit on birds. But for now, perhaps I’ll keep the poems personal. Or maybe I would take the easy way out the first time and recycle an older blog. While that’s an option that I’ll keep open, I want to come into the flock fresh! And so I thought about it and that maybe sharing my experiences with some students in my summer conservation ecology class would make an appropriate entry into the "Birding is Fun!" community. As birders we all appreciate diversity and in fact I like being different. How so, you might ask? You see, I happen to be a B.O.C.. What’s that? Well, it’s a Birder of Color. In case you haven’t noticed, birding is a pretty homogenized past-time. The flock of folks who enjoy what many have characterized as the most popular outdoor hobby in the U.S. might be favorably compared to a gaggle of white-phase snow geese – with a few dark hued blue morphs thrown in here and there to make things interesting. I happen to be one of those uncommon dark hued birds. I’m not blue though, I’m black. Being one of the few B.O.C.s out there, I am constantly on the lookout for ways to expose non-traditional audiences to the joys of birding and being out in nature. I get the chance here and there but hardly ever the extended time and concentrated attention I’d like to get my point across. My summer gig gives me the perfect opportunity to do just that. 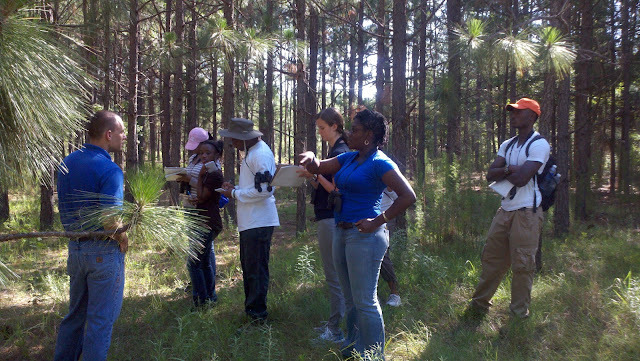 A few years ago, I signed on with South Carolina State University and the US Forest Service at Savannah River o teach wildlife ecology to students in a an environmental sciences field station. Most of the students are juniors and senior undergraduates and come primarily from Historically Black Colleges and Universities (HBCU's). 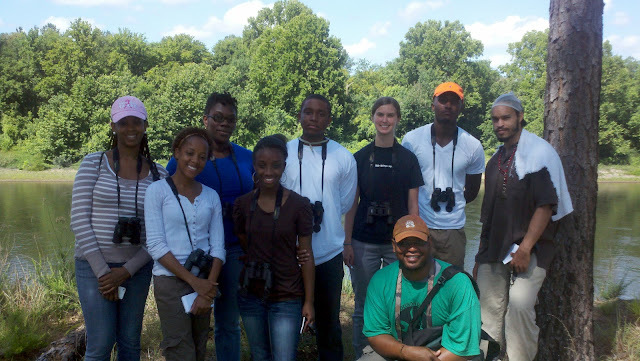 The mission of the field station, run by my good friend Dr. Denise Simmons, is to expose a traditionally underserved audience to environmental issues ranging from remediation to soil science and in my class, wildlife conservation ecology. 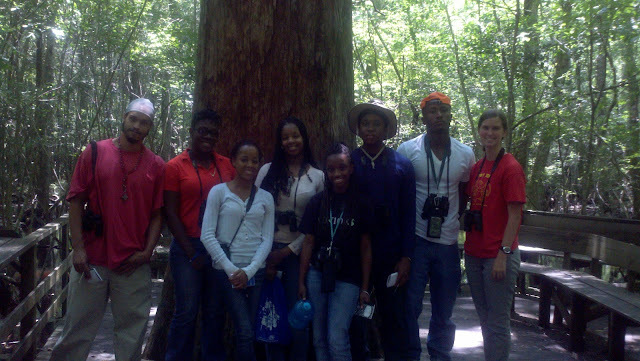 Although few of the students are in majors I would consider “environmental" sciences, they are at least in S.T.E.M. (Science, Technology , Engineering, Math) disciplines. It is a palette I can paint on. And so for four weeks in June, I finally have the forum to focus a small group of folks in to the necessity of nature and why it is especially important that they think about the environment as people of color. Yesterday, I was out and about in the heat and humidity of a South Carolina almost-summer day with eight nearly dehydrated yet attentive field station students trying them to “connect the conservation dots.” The task, simple in concept but absurdly difficult in practice, is putting the pieces together to make some greater whole. For us birders and conservation professionals that means connecting bits and pieces of habitat to make things better for warblers, thrushes, tanagers and other birds we love. Since most of the students have never birded or botanized my goal for them is not so much be able to identify every bird they see and hear or snap off the latin names of plants. Rather it is to put themselves in the context of a larger, nature-centered focus. So my questions to them often go like this: “So guys, we’ve seen 1,000 year old cypress trees in the Beidler swamp watching over Prothonotary warblers, people promoting hunting to save wild turkeys and other wildlife at the National Wild Turkey Federation, and longleaf pine forests that need to be burned to conserve bobwhite quail. What ethic connects these things together?" Of course the simple answer is conservation. They all get “A’s” there. But I press the issue forward, asking them how THEY fit into all of this. For an African-American engineering technology major from suburban Columbia who doesn’t know a warbler from a hole in the ground, the answer is never an easy one. 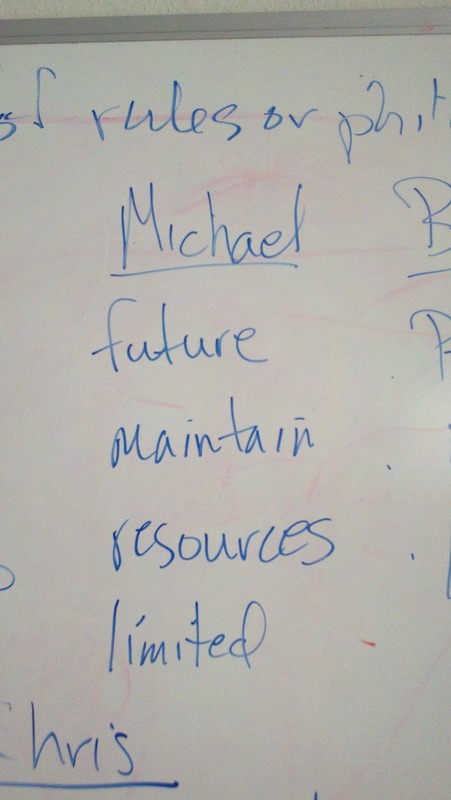 To see the larger picture one of the first assignments I gave was to have each student compose a conservation ethic. Not only that but I ask them to blog about it and talk to their peers about it. Now some of you know that I’m a Leopold-ite and as such push the ideas of the land ethic whenever I can. And so the students are also responsible for reading A Sand County Almanac to help prime their pumps for the “connect the dots” exercise. 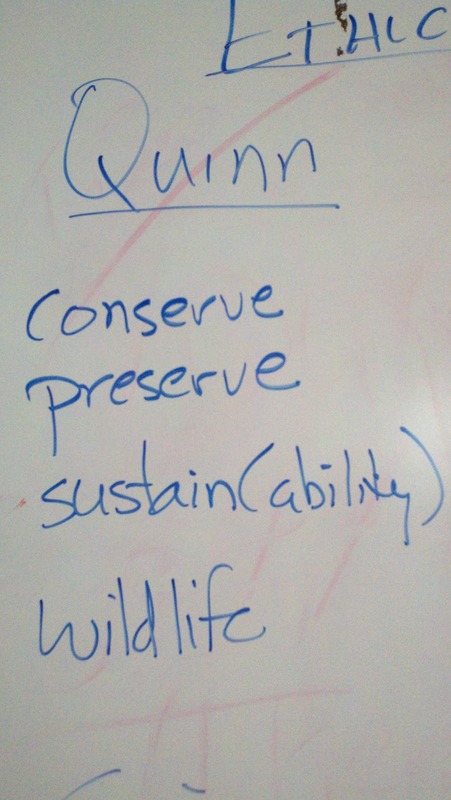 Although I got back a couple questions back like “What’s a conservation ethic?” (…and sadly, one that I also get from my Clemson wildlife and forestry major students who are supposedly steeped in the stuff at a Land Grant Institution) I was pleasantly surprised at the responses. 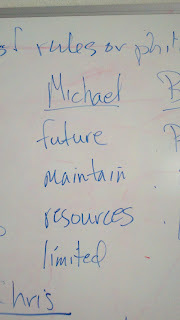 Words like “sustainability”, “love” and “legacy” showed up. Phrases reflecting the connections between life, wildlife and our lives or honest statements about a lack of connection to nature but a desire to learn filled my head and heart with hope. They are showing that there is a color to conservation and it needs to be brought out. Their blogging is evolving and I can see the connections being made from the ground up. 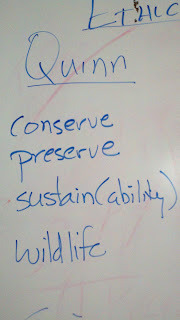 As much as I push the teaching of Aldo Leopold, I’m learning a valuable lesson from my summer students. It is not an easy thing for many young African-Americans who’ve grown up connected to nature by a satellite dish and a few wildly exaggerated contrived "nature" shows to relate to some old white guy who wandered around on an abandoned farm in Wisconsin waxing poetically about “good oaks” and such almost eighty years ago. As much as I’d like to think that these kids would connect like I did –growing up rural and full of wonder when it came to birds and the world outside—it’s not the case. Most are growing up in urban or suburban settings and even those that grow up in rural areas are looking to get out as soon as possible. We need to help these folks reconnect in relevant ways. And so I think that I will begin to work on a “translation” of my beloved “Sand County”—a “revised standard version” of the conservation “Bible” if you will. Heck, if folks can translate the words of dieties and religious prophets to make them modern and relevant, why not the words of a conservation prophet? It’s high on my writing to-do list! Stay tuned. Outside of a couple of lectures to introduce them to the principles of conservation ecology, I didn’t want to waste good, sunny days on boring PowerPoint presentations. That means most days we load into an aging but functional (and air conditioned!) mossy green Dodge van and hit the road. 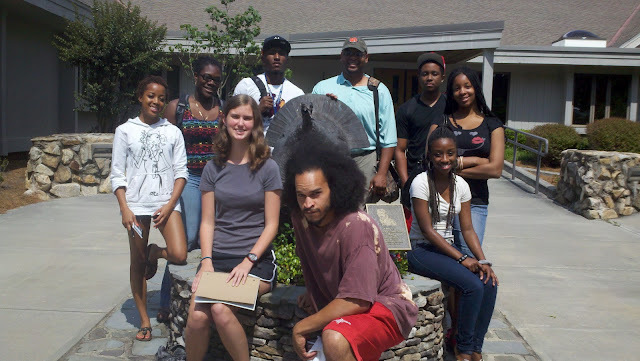 So far my octet of students have been to the National Wild Turkey Federation in Edgefield, SC to learn a little history and how conservation in the United States has been supported by the efforts of people who like to occasionally kill the things they love. Doesn’t that sound odd? That someone would watch birds and try to kill some of them seems “wack” to many folks. Well it’s not. As a turkey and deer hunter, I pay taxes and license fees that go back into supporting the resources I occasionally exploit. Birders seldom bear the same burden. Let’s be honest here. Because I spend so much time watching for other birds in the new green spring woods, the turkeys win almost every time and so some might call my efforts less hunting than just being out. But I proudly carry the hunter banner and the ideals of the North American Model for Wildlife Conservation and want the students to understand the ethic that underlies that. I saw the connection exemplified almost like nowhere else when I was at Magee Marsh a few weeks back at the “Biggest Week in American Birding” and was re-invigorated to make sure I carry the message forward. The students seemed thrilled to be so up close and personal with a bird as grand bird as the wild turkey and I think they got the message. Even though none of them hunt, they all like to eat meat and so they understand the connections to legacy, sustainability, ethical hunting and conservation. 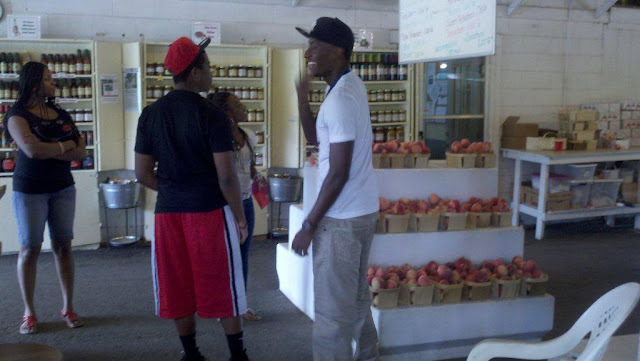 They were rewarded with a stop at a local produce stand on the way home to buy some of the sweetest peaches in the world that grow on the sandy South Carolina ridges and in doing so support local foods and sustainability! Experiential learning is a good thing! Next, I wanted them to see conservation on the grandest and oldest scale with superlatives presented in the ages of trees and expanses of rare habitat. 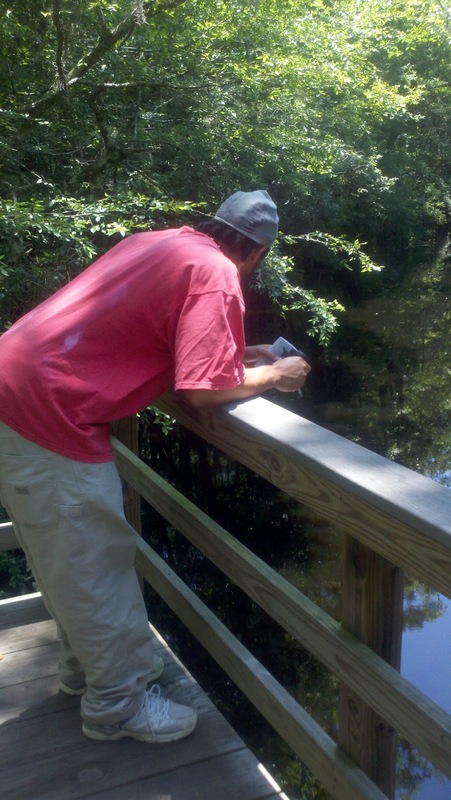 We took a trip to Beidler Audubon Sanctuary in Harleyville, South Carolina. This is the kindest, wildest place I know as you can wind through true old growth, virgin timber in your tennis shoes and shorts without concern for cottonmouths. And so novices and non-nature-nics can be comfortable in the midst of wildness. It is a place where many of the bald cypress, tupelo and other trees are hundreds of years old with a couple of specimens more than a thousand years in the growing. It is the largest expanse of virgin bald cypress swamp in the world and it’s in our back door here in South Carolina. It’s a place where golden nuggets of feathers called Prothonotary warblers flit through the buttressed colonnades of forest almost close enough to touch. It is a place where water controls the ebb and flow of life. It’s a place I wanted them to hopefully be engulfed by so many grand things that their minds turned off of the mile-a-minute mental interstate for a moment and wandered the back roads at a slower, more contemplative pace. Sure, I wanted them to have a close encounter with a Prothonotary or hear the baritone bawl of a barred owl; but more than that I wanted them to see the connections to conservation in saving things that maybe serve less of a tangible purpose. Sure, they understand the ecological services bit—tree give us oxygen, pollinators give us food, watersheds filter…blah, blah, blah. Really I wanted them to let a little bit of the idea that these were beings that had seen sunrises over a landscape where Native Americans held property right and shared the bounty of a largely unbroken land with panthers , Carolina parakeets and Ivory-billed woodpeckers . I wanted them to touch something that had seen more than they, their children and legions of generations forward would ever see. I wanted them to think about time outside of the years in the span of a human lifetime. I wanted them to let the trees and the swamp into their souls. Love it and you will save it. As we stood around the Meeting Tree, a humongous bald cypress that would take a half-dozen of us to hug, I could see the place getting into some of them. The questions flowed along with” ooooo’s” and “ahhhhhh’s”. By the day’s end, we had indeed seen a Prothonotary up close and personal, singing his little golden swamp warbler guts out to proclaim his swampy knothole as the best in Beidler. But I could detect that the students took away a lot more than just the names and field marks I pointed out. Check! More dots were connected. And so yesterday was another chance to expose them to something new. 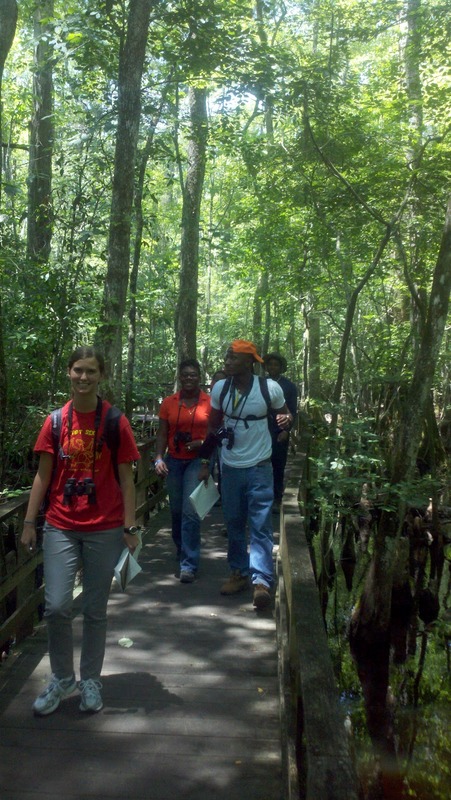 This time, I wanted them to see how the same organization, South Carolina Audubon could conserve old growth in one place with a preservationist perspective, and not more than a couple of hours away in another sanctuary at Silver Bluff, manage the threatened long leaf pine ecosystem and wetlands for federally endangered wood storks in a much more intensive manner. Our trip to the center was a hit as Brandon Heitcamp, a Clemson trained forester with an ecologist’s heart, took us on a tour to talk about how he helps the forest work for birds by burning it. What?! Burning things on purpose to make them better? As Brandon showed us stands of longleaf pine in different stages of recovery and regeneration, it was clear that this is a very hand’s on place. He spoke with pride about the strip fires he employs like a paintbrush to get the pine to grow with a carpet of wire grass and broomsedge underneath it. He talked about the risks of natural resources management and the reward in walking through head high wire grass or hearing a bobwhite whistle in the pines. Only a few years removed from where my summer students are as undergraduates, Brandon showed them what it took to be a young, competent, confident conservationist. The students listened intently to him and were asking questions even though the humid heater of the day was turning up. About mid-morning we made our way to the namesake place for the sanctuary and looked over the sluggish Savannah River from a bluff fifty feet above the water. A red-headed woodpecker flashed black, white and red through the woodland and then a pileated laughed maniacally at us –maybe for being out in the heat --before flapping across to the shade on the Georgia side. The place is full of history and Brandon helped the students connect the dots between all the peoples that had stood where we stood-Indians, Spanish Conquistadors, English settlers, African slaves and us. As we left the river to finish up at the fish ponds looking for wood storks, I felt the swelter we were enduring was worth the sweat. I am constantly asking questions on the van as we travel and the responses are largely thoughtful. At the ponds where the managers draw down the water to make the fish more available to the flocks of waders that will come into the refuge, the students watched a Mississippi kite float on the humid air. They got to see and learn about water turkeys (that’s Anhinga anhinga for you purists) and even saw a wood stork spiraling higher and higher on a thermal like a feathered glider. One of the students found a molted nuptial plume from a great egret and I got a chance to explain how much of the conservation movement got started because of the greed over such a fine and delicate thing and women’s desires to satisfy the fashion thing. It was hot and getting hotter but they trudged on listening and seeming to enjoy the day. egret nuptial plume - a feather that started a movement! And so that is how I am spending my summer. Well, at least the June portion of it. It has been a fun and rewarding experience for me and I hope for the students. While their bird list will likely limit out at 25 or 30 birds and an assortment of lizards, frogs, toads, turtles, mammals and plants, I am not unrealistic in trying to create uber-birders or all-knowing naturalists. No, I’ve had to release my ego and understand that not everyone is going to connect the dots just like I do. But in the three weeks so far that I’ve had the pleasure of being in the company of Javashia, Iris, Briana, Quinn, Michael, GiGi, Simone and Chris, there’s been teaching and learning alike. And it’s been a pretty fair exchange. As these young folks connect the dots to where they live and how they see nature, hopefully in the new light of a few pretty cool birds and other wild things, I’m hopeful. I’m connecting dots too. This time they are look a little (no a lot!) different than the ones I’m used to seeing. Eight more dots that might think about birds, nature and their connection to them can only move the mission forward. Until next time folks—keep connecting dots of whatever color you can where you are! P.S. A huge thanks to Robert Mortensen for giving me this platform! 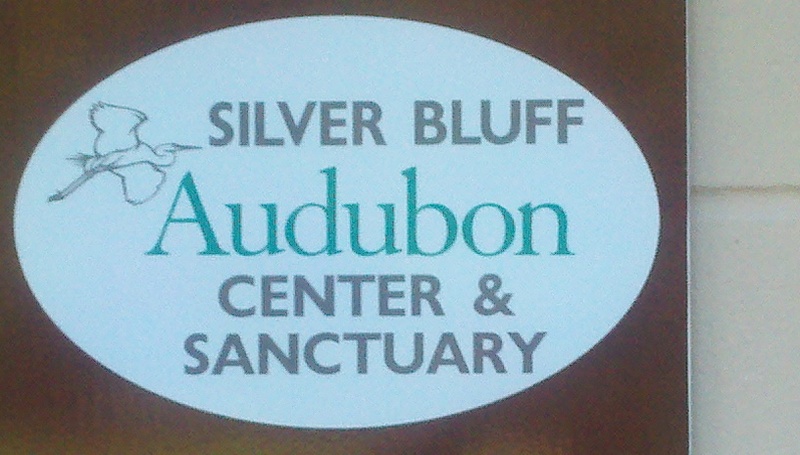 I am amongst bird-brained conservation kindred here and some really cool folks. I'm glad to be in the number and offer a little "Down South" flavor of a different hue! Looking forward to the blogs ahead! what an inspiring group and overall program. I hope programs like this spark up all around the nation, thank you very much for posting this! If I wanted to start a similar program for underrepresented youth, should I approach my local university? Drew, very inspirational work you are doing! I remember so well the words from John C. Robinson's book "Birding for Everyone" and you are perfect example of acting on the solutions John suggested. A very worthy, important project you have underway Drew, and it looks like you all saw some great birds along the way! It's a great pleasure to read about your work, both because of the optimism and skill with which you craft your writing. Awesome to read about what you are working on this summer Drew! 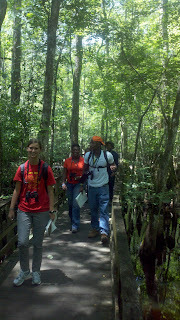 Welcome to Birding is Fun, it is great to have you here with us. Hope to go birding with you again soon! Welcome to the BiF! team, Drew. What an outstanding way for you to begin! Your words never fail to educate me and inspire me to do more. Thank you, my friend. Very nice post about a great project Drew. Welcome aboard. Great post Drew! Sounds like an outstanding program. Thanks for sharing! A wonderful inaugural post about a wonderful program. It really is our responsibility to drag young people away from their electronic world to remind them that we are all part of the natural world and that we all share responsibility for it. Thank you for doing that. And welcome to BIF! Glad to see someone is doing such valuable work.I haven't seen much diversity in the Connecticut birding scene but I hope that changes. It will make things more interesting. Drew, what an inspiration you are! This sounds like an exceptional program. I have great admiration for people like you who make a big difference in this world. Wonderful work! Drew, welcome to BiF and this is a great first post!